Lightweight materials are finding their way into trucks. Ford proved that much when it sheathed the F-150 in aluminum. 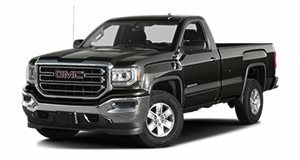 And GMC is going a step further by giving the Sierra a carbon-fiber pickup bed, now available to order. The GMC Sierra 1500's CarbonPro bed offers a long list of benefits over a traditional steel bed. It's 25 percent lighter, for starters, reducing the truck's curb weight by 60 pounds. It's also more resistant to dents, scratches, and corrosion. And because the material is thinner, the bed can accommodate an extra cubic foot of cargo. It also obviates the need for a spray-in bedliner, wheelhouse liners, and even paint. And the carbon-fiber bed is made with indentations baked right into the structure to better hold motorcycles in place. General Motors extensively tested the carbon-fiber bed to make sure it could withstand corrosion, extreme temperatures, dropping heavy loads, the heat and vibration of a portable generator, and the metal studs on a snowmobile's tracks. Plus, you know... it looks cool. "CarbonPro is made of the same raw material found in seven-figure super cars and even aerospace applications,” noted GMC chief Duncan Aldred. The option is being rolled out initially on special CarbonPro Editions of both the luxurious Denali and rugged AT4 versions of the 2019 GMC Sierra 1500 before being expanded to other trim levels next year.